It’s Good for Employees. It’s Good for Business. Because adult Canadians spend so much time at work, it’s a good place to promote physical activity. Many adults have little time for leisure activity during the work week. If they can’t find ways to be active during their workday, they may not be active at all. Work is not only a good place to promote healthy habits but the workplace itself has an impact on people’s health. Employers who find ways to help employees be active during their workday contribute to both health and job satisfaction. Being active also improves employees’ energy level and morale. People who enjoy their work and feel their employer cares are more productive. Most Canadians believe that regular physical activity improves the ability to cope with and reduce stress (91 per cent) and helps them be more effective on the job (85 per cent). Canadian Fitness and Lifestyle Research Institute, Physical Activity Monitor. Why Is Workplace Physical Activity a Sound Investment? Two trends drive home the importance of increasing physical activity at work. Canada’s workforce is aging. As people age, they tend to be less active. Inactivity increases the risk of chronic disease and death. People over 45 use more health care than younger people, so benefit costs and absenteeism are expected to rise. Workers report increasing stress. Physical activity has valuable preventive and therapeutic effects. For instance, a physical activity and mental health literature review undertaken by the Minding Our Bodies project in Ontario found that physical activity can keep people mentally healthy. It can also help prevent and treat anxiety and depression. 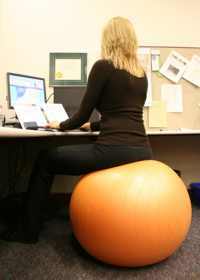 Want more proof of the benefits of workplace physical activity? The evidence outlined below is adapted from the Public Health Agency of Canada’s Business Case for Active Living at Work. Forty-four per cent of working Canadians feel that employer support of employee physical activity would help them be more active. Increased worker stress is causing increases in workplace illness and sick days. In 2005, the Conference Board of Canada reported that health expenditures are 50 per cent more for workers who report high levels of stress and that stress-related absences cost Canadian employers $3.5 billion each year. A 2010 report noted that, on average, absenteeism costs organizations 2.6 per cent of payroll, which economists estimate translates into $7.4 billion in lost wages to the Canadian economy overall. Physical activity can help people cope with stress. In addition, an employer who invests in a physical activity program sends a positive message to employees. According to a 2010 briefing published by the Conference Board of Canada, productivity losses among workers with chronic diseases are nearly 400 per cent higher than the costs for treating the disease itself. According to a chronic disease report from the World Health Organization in 2005, it was estimated that Canada would lose 500 million dollars in national income in 2005 from premature deaths due to heart disease, stroke and diabetes. This loss was projected to continue to increase. At the time, the report projected that Canada would lose 9 billion dollars over the next 10 years from premature deaths due to heart disease, stroke and diabetes. Workplace physical activity programs can reduce sick leave by up to 32 per cent and increase productivity by up to 52 per cent. Health Canada states that employees’ work performance can be improved by four to 15 per cent through participation in regular physical activity. A review of selected studies by the Public Health Agency of Canada found that physically active employees take 27% fewer days of sick leave. In a study of employers coordinated by the Public Health Agency of Canada, organizations reported that physical activity programs reduce absenteeism by up to 20%. One of the participating employers, Toronto’s Metro Fit, reported that employees missed 3.35 fewer days in the first six months of the fitness program than employees who were not enrolled. Another employer, BC Hydro, estimated that physical activity initiatives reduced sick leave costs by $1.2 million a year. Physical activity programs can reduce the number of injuries in the workplace by 25 per cent. Physically fit workers have fewer injuries, and those injuries tend to heal faster and cost less. The Canadian Life Assurance Company found that the turnover rate for fitness program participants was 32.4 per cent lower than average over seven years. BC Hydro employees enrolled in a work-sponsored fitness program had a turnover rate of 3.5 per cent, a fraction of the company average of 10.3 per cent. Toronto Life Assurance found that employee turnover for those enrolled in the company's fitness program was 1.5 per cent, versus 15 per cent for non-participants. For each corporate dollar invested in physical activity, Canada Life in Toronto showed a return of $3.40 in reduced turnover, productivity gains and decreased medical claims. A workplace that supports employee physical activity can also attract and maintain quality employees, improving its social environment as well as its corporate image. Workplace benefit costs are increasing because the workforce is aging. Physically active employees report 14 to 25 per cent fewer disability days. Benefits of Physical Activity: Information from the Public Health Agency of Canada about the benefits of bringing physical activity into the workplace. Business Case for Active Living at Work: This Public Health Agency of Canada website includes statistics, trends, returns on investment and case studies. Conference Board of Canada: Offers several reports related to workplace health as well as proceedings from the 2005 conference, Workplace Health and Well-Being: Measurement in Action.